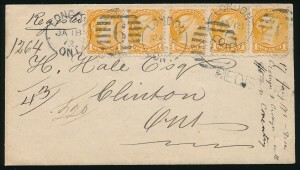 Lot 34 Canada 1871 1c yellow orange on thick, soft paper, horizontal strip of five tied to domestic registered cover by three strikes of duplex cancel, paying the 3c letter rate plus 2c registration fee. Mailed from London, Ont. 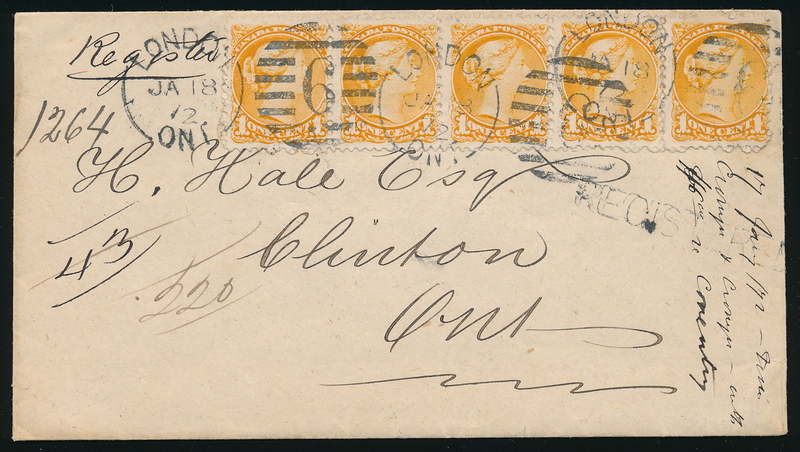 (duplex #6 dated JAN.18.1872) to Clinton (next day receiver on back). A lovely and rare cover, bearing the largest known multiple of this very scarce paper variety, very fine. (Unitrade 35ix). Provenance: John Siverts (1989), Ted Nixon (2012).